could be perfect for your group or fundraising effort! seasoned, New York comedians. 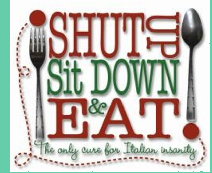 It features the comedic styles of Joe Moffa, Chris Monty, Tina Giorgi and Eric Tartaglione. The plomedy is also blessed to have the talented director, Tom Ingegno, behind the scenes. It began its theatrical run to rave reviews. If you're tired of the typical and really need a good belly laugh, call ZipStohr at 413-822-2247. We can talk about scheduling the perfect evening of fun. Is Comedy Central canceling "Comedy Central Presents...? for better things!). 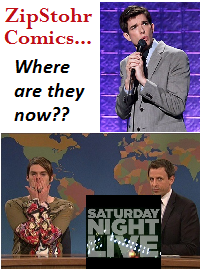 Three of our comics actually had 2 "Comedy Central Presents..." specials: (Tom Papa, Greg Fitzsimmons & Ted Alexandro). The other ZipStohr comics to have their own specials are: Nate Bargatze, Bill Burr, Tom Cotter, Joe DeRosa, Rachel Feinstein, Vanessa Hollingshead (to appear here March 10th), Cory Kahaney, Myq Kaplan, Andrew Kennedy, Lisa Landry, Jamie Lissow, Shane Mauss, Juston McKinney, Kurt Metzger, John Mulaney, Dan Naturman, Louis Ramey, Tom Shillue, and Mike Vecchione. Letterman on CBS. The current edition of The Comedians Magazine features an interview with Kurt Metzger (Comedy at the Plaza 13). Bernadette Pauley (Comedy at the Plaza 9) was the magazine's covergirl late in 2011. Vic DiBitetto (Comedy at the Plaza 14) was one of a few very fortunate comics invited to roast Soprano's and Goodfellas actor Tony Darrow in September. Darrow (Larry Boy Barese on The Soprano's and Sunny Bunz in Goodfellas) was also roasted by celebrities like James Gandolfini and Chazz Palminteri. Bill Burr (Comedy at the Plaza 3) was honored with the Comedian of the Year Award at the Boston Comedy Festival in November. ABOUT OUT LAST COMEDY SHOW!! RODNEY LANEY: Laney has completed pilots for Comedy Central, MTV, A&E and has been seen on P.Diddy's "Bad Boys of Comedy" on HBO, Fox News Channel's "Red Eye," "The Late Late Show with Craig Ferguson" on CBS, Comedy Central's "Premium Blend," and in London on the BBC's "The World Stand's Up." He can currently be seen on truTV's "The Smoking Gun Presents..." Most recently, Rodney can be seen on "comedy.tv" on the HD channel and will soon be seen on "LOL Lounge" when TBS Presents A Very Funny Festival: Just for Laughs Chicago. He has also appeared at the prestigious Just for Laughs Comedy Festival in Montreal. 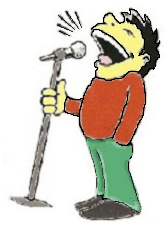 Some comics wait for their big break, not Rod, he is making his big break. In 2001 he acted and executive produced his first feature film "Pride & Loyalty," which started its pay per view release June 2002. It starred an array of soap stars from "One Life to Live," "Guiding Light," and "All My Children" including: Marj Dusay, Gina Tognoni, John Bolger and Emmy nominated Rebecca Budig. Laney was the feature (middle) act in ZipStohr's Comedy at the Plaza #2 six years ago. We are incredibly pleased to have him back headlining our next show! BUDDY FITZPATRICK: Buddy's stand-up made him a regular on Comedy Central with appearances on ABC and A&E. Buddy can be seen in the Damon Wayans' film "Harlem Aria" and in "The Business of Strangers" starring Julia Stiles and Stockard Channing. His television credits include "The Sopranos" on HBO. Buddy has written, produced and performed his biographical play "Sides" at various NYC theatres. Buddy's new DVD, "Carry the One" is currently priced at $10.00, but due to today's economic crisis, he's selling them for $99.99!! Fitzpatrick opens for such acts as Chris Rock, Joan Rivers, Kevin Pollack, Lewis Black, Larry David, Wendy Leibman, Adam Ferrera, Christopher Titus, Bobby Slayton, Paul F. Tompkins, Ari Spears, Dom Irrera, & Emo Philips. He has also opened for The Beach Boys, Kenny Loggins, The Doobie Brothers and Frank Sinatra, Jr.
VANESSA HOLLINGSHEAD: Vanessa was recently seen on VH1's "Lords of the Revolution". Her own "Comedy Central Presents..." half-hour special was tremendous! Hollingshead taped her third DVD, "Drunk” at Stand Up New York, October 17th. She was one of the first comics to go to the Middle East when the war started. She has performed for Comedy Central in Australia, as well as numerous shows in the UK and Amsterdam, she also has had critical acclaim with her one-woman show "Flashback”, and just complete her second one-person show, called "The Hold”. Vanessa is the quintessential native New Yorker. She just got her drivers license a couple years ago. She spent a year at Millbrook Mansion with her father who introduced Timothy Leary, and later, Paul McCartney to LSD. After an accidental "trip” of her own at 5 years old, she returned to the care of her mother who was trying to juggle the full time career of finding good grass in bad neighborhoods with her responsibilities as a mom. Throw in two years on a commune by herself, two years in London with her dad, a decade of temp work and her angst was complete. Coincidentally, a comedian was born! 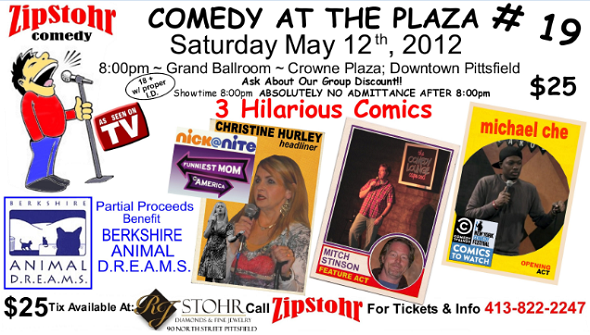 ZipStohr's Comedy @ the Plaza #19 will be Saturday MAY 12 at 8:00pm in the Grand Ballroom of the Crowne Plaza in downtown Pittsfield. TICKETS are still only $25; For information call ZipStohr at 413/822-2247. Tickets are available at RJ Stohr Diamonds & Fine Jewelry, 90 North Street Pittsfield (Monday-Friday 9:30am - 5:30pm, Thursday 9:30am-7:00pm, or Saturday 9:30am-4:00pm) THE EARLIER YOU BUY/RESERVE, THE BETTER YOUR SEATS WILL BE!!!! ALL THREE COMICS HAVE HEADLINED ROOMS EQUIVALENT OR LARGER THAN OURS!! It'll be a PHENOMINAL show! Call Rick (413-822-2247) for pricing & information. Please support these great sponsors! !